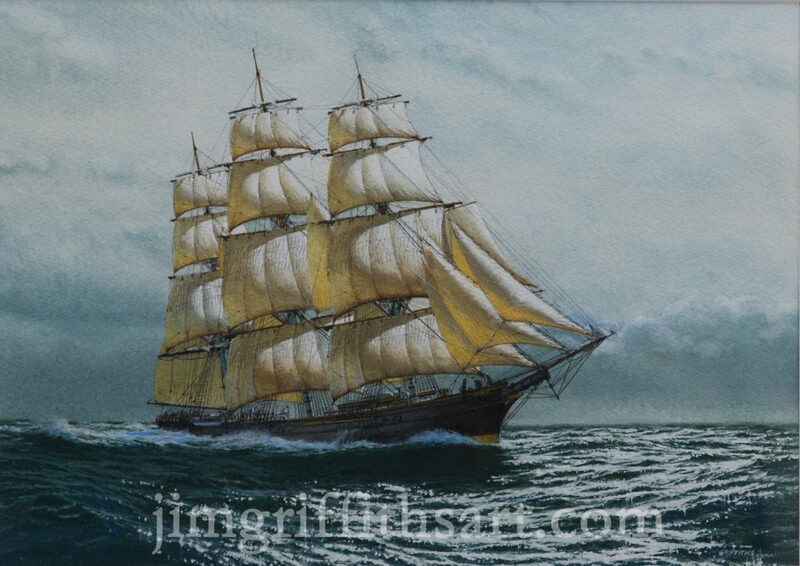 "A Change in the Weather", 12 1/2 x 19,” British tea clipper Spindrift; Courtesy of the Jinishian Gallery. 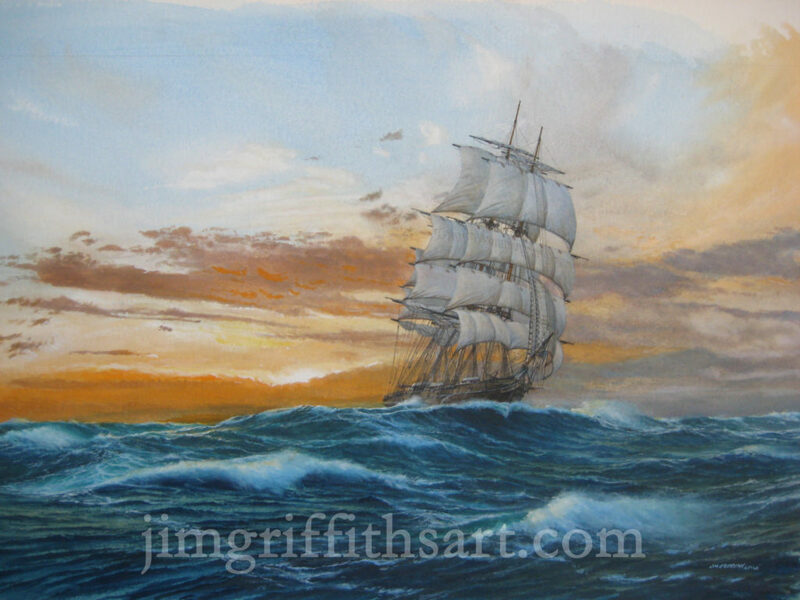 "A Break in the Clouds", 12 1/2 x 19", U.S. extreme clipper Sweepstakes; Courtesy the Maritime Gallery at Mystic Seaport. 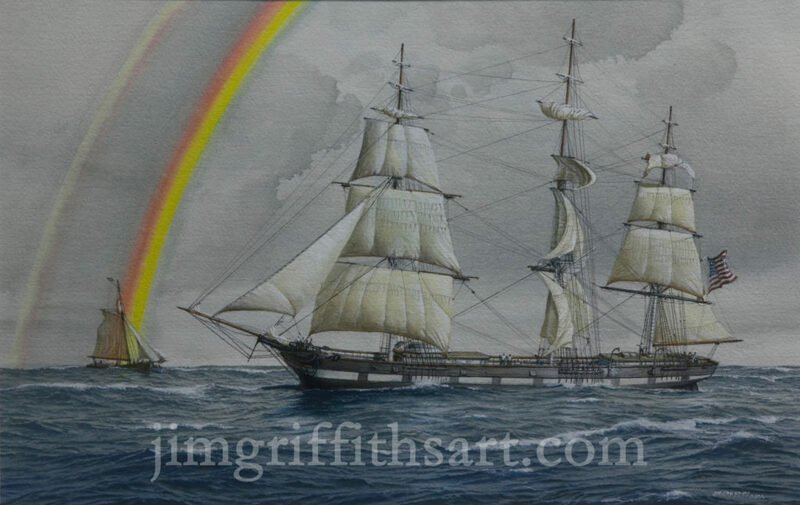 "After Her Namesake",12 1/2 x 19", U.S. clipper Rainbow - 1845; Collection of the Artist. 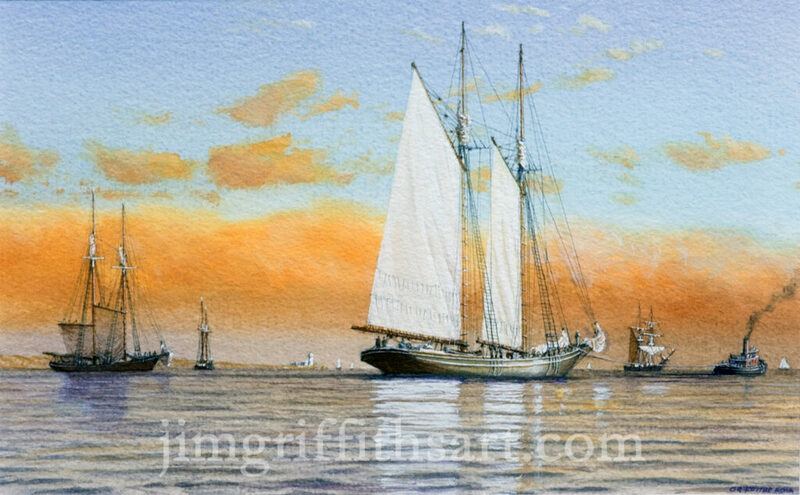 "Afternoon Departure", 10 1/2 x 15", 4 masted schooner laden with lumber; Collection of the artist. 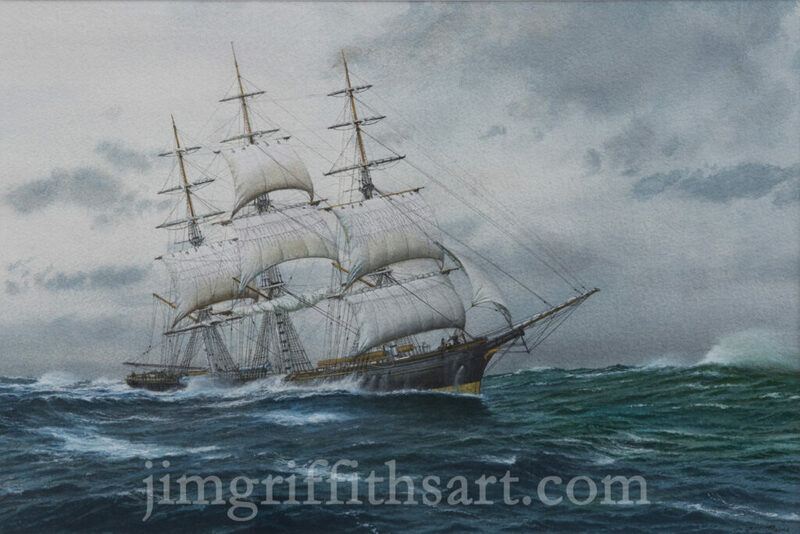 "Atlantic Weather", 6 1/2 x 11"' U.S .extreme clipper Golden West; Sold. 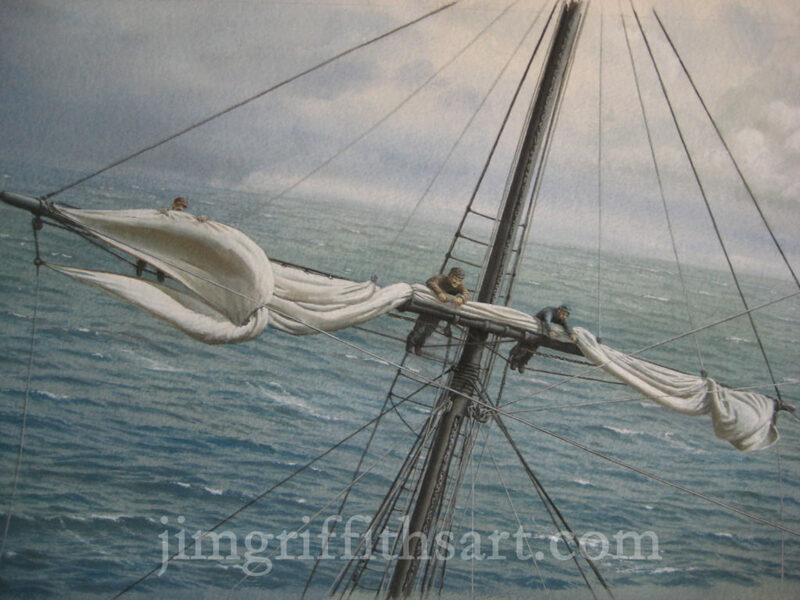 "Bringing in the Royals", 10 1/2 x 15", U.S. extreme clipper Flying Fish; Sold. 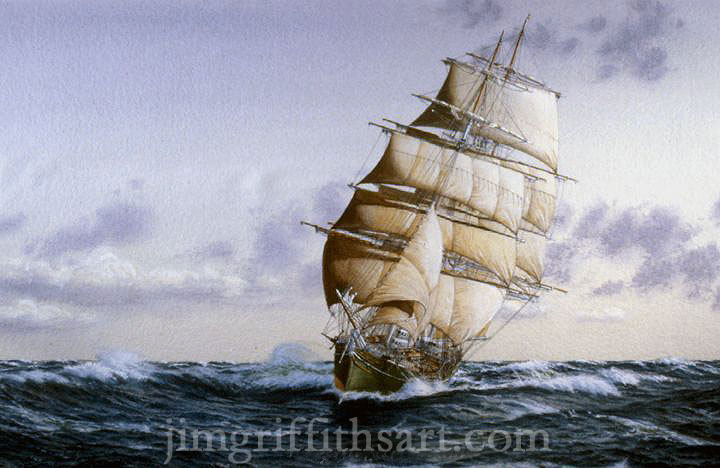 "Bringing in the Royal", 11 1/2 x 19", sailors furling mizzen royal sail; Collection of the artist. 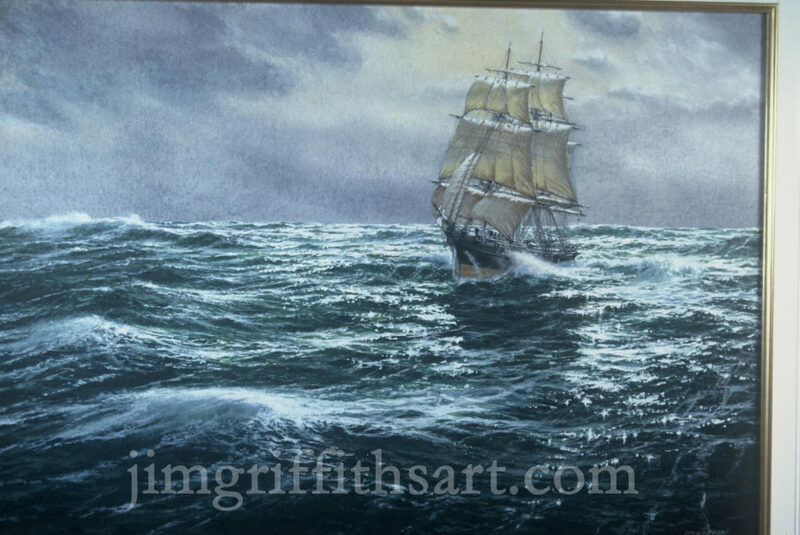 "Dangerous Weather", 12 1/2 x 19", British wool clipper Cromdale; Sold. 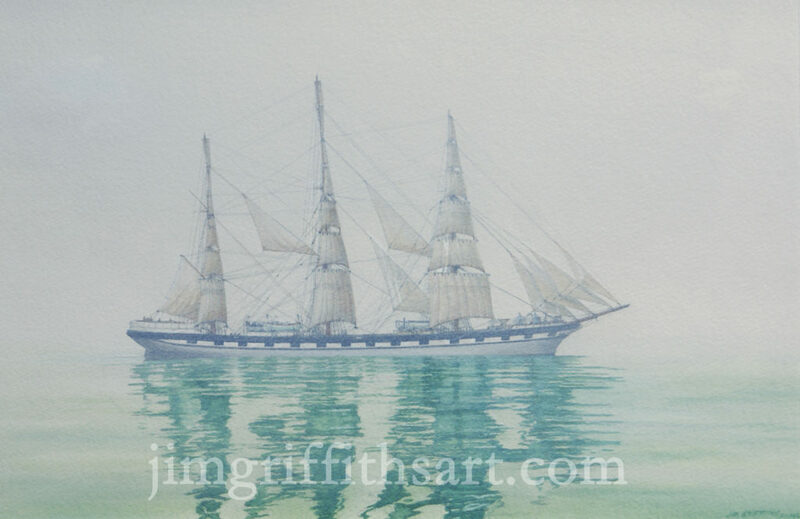 "Down the China Sea", 12 1/2 x 19", British tea clipper Thermopylae; Courtesy of Jinishian Gallery. 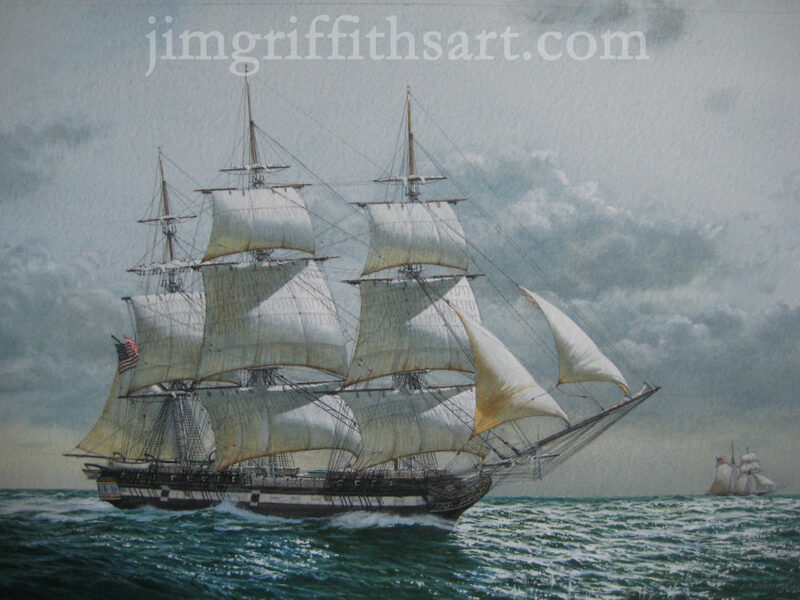 "Driven", 12 1/2 x 19", British tea clipper Thermopylae; Courtesy of the Maritime Gallery at Mystic Seaport. 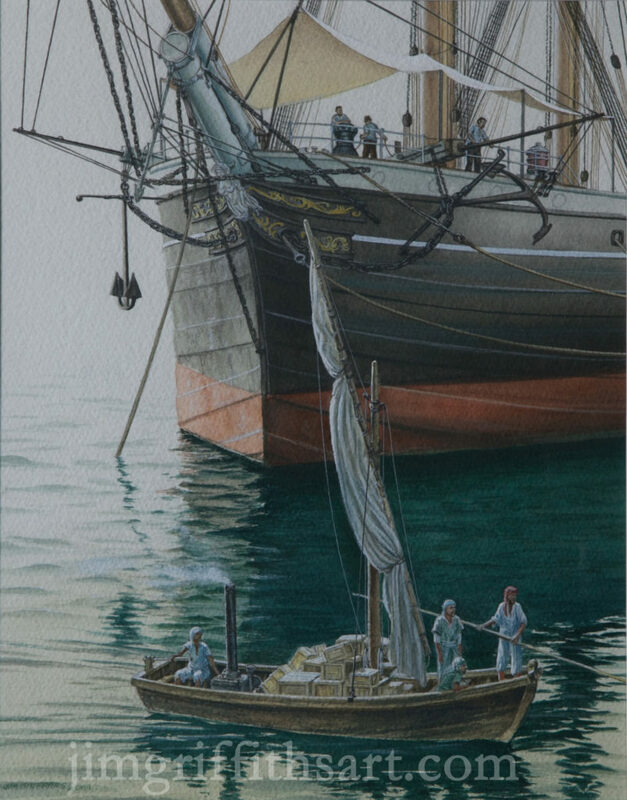 "East of Suez", 10 1/8 x 12 7/8" (vertical),scene in Aden harbor, Yemen, early 1900s; Collection of the artist. 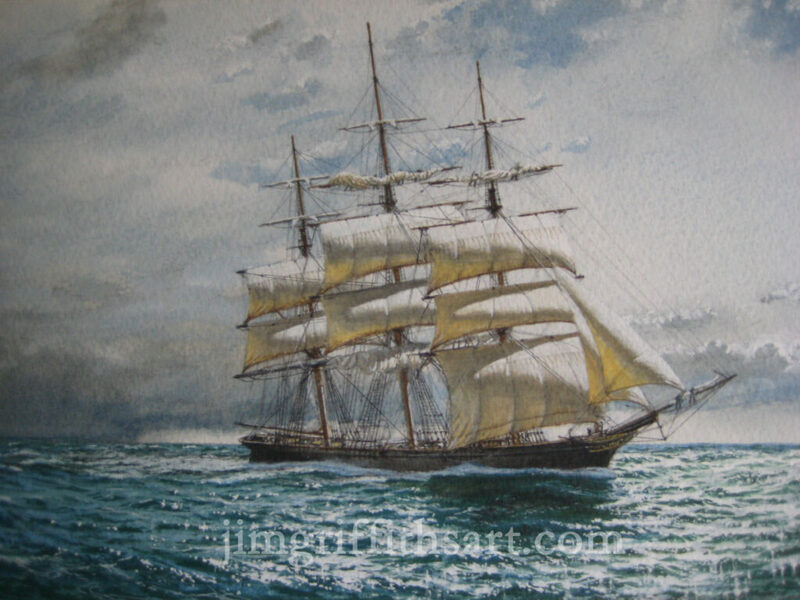 "Evening Showers", 6 1/2 x 11", the barque Edward at Stauanger, Norway, 1904; Sold. 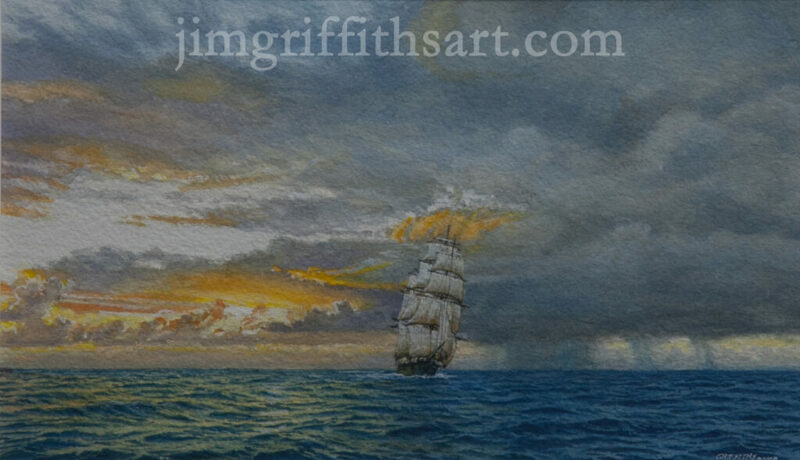 "Far From Home", 12 1/2 x 19", evening approach in the mid-Pacific; Sold. 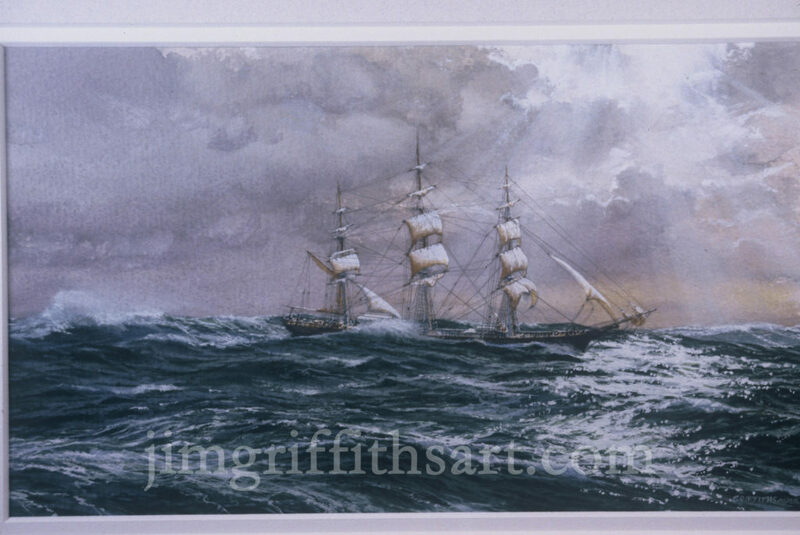 "Fleeting Colors", 12 1/2 x 19",British tea clipper Taitsing; Collection of the artist. 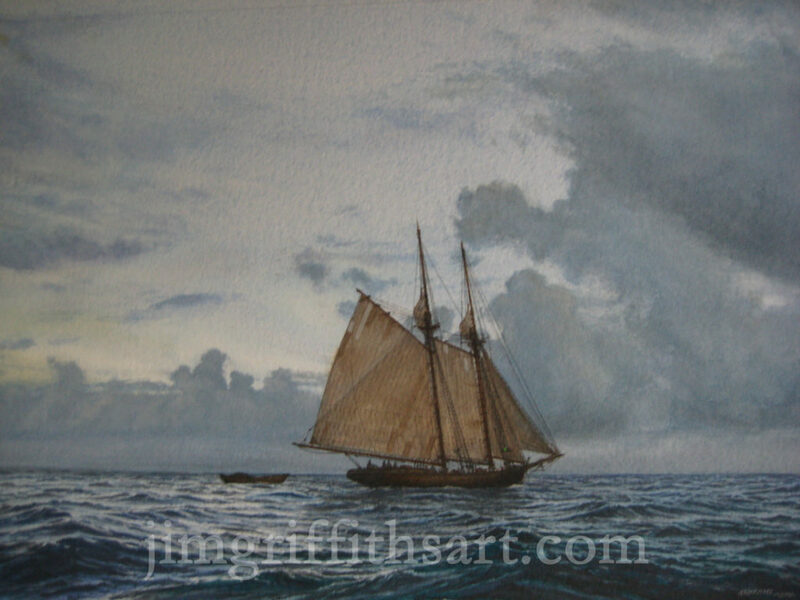 "From Summers Long Ago",10 1/2 x 15" (vertical), 2-masted sailboat waiting to be used; Collection of the artist. 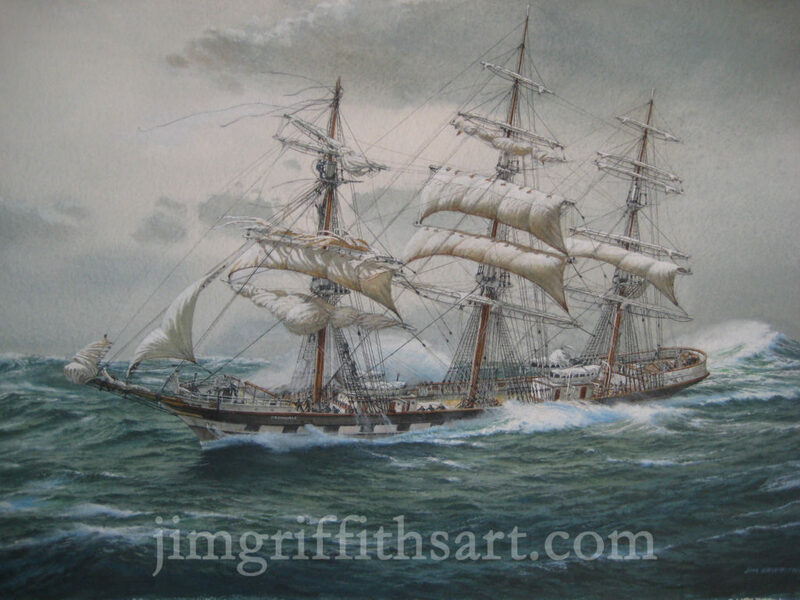 "Ghosting Along", 12 1/2 x 19", steel ship Mount Stewart; Courtesy of the Maritime Gallery at Mystic Seaport. 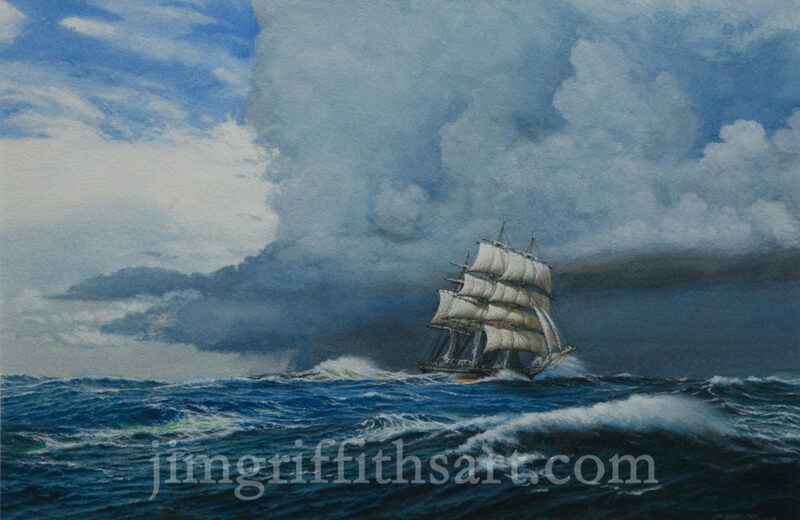 "Heavy Weather", 12 1/2 x 19", U.S. extreme clipper Flying Fish; Courtesy of the Maritime Gallery at Mystic Seaport. 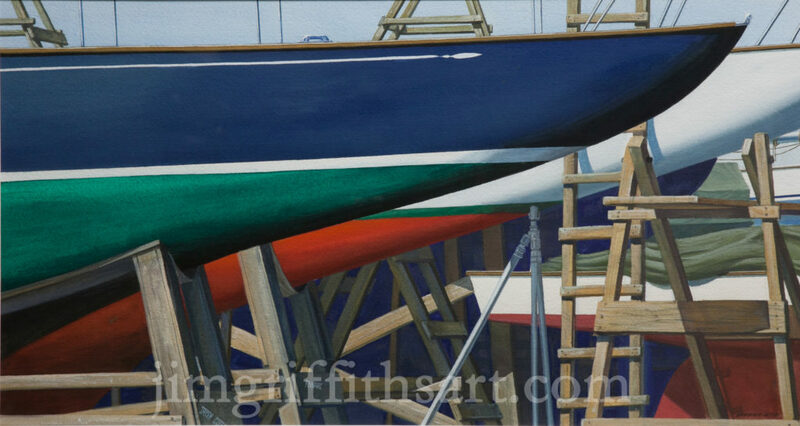 "High and Dry", 13 3/4 x 25 1/2", sailboats in dry dock; Collection of the artist. 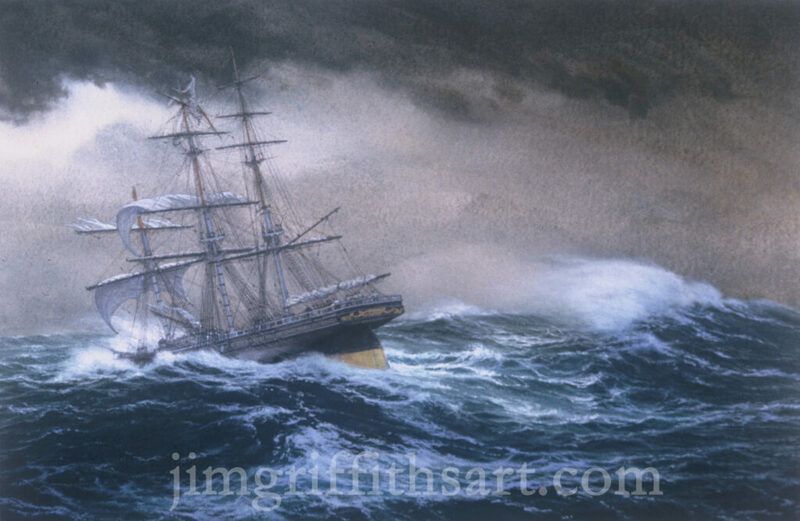 "In Extremis", 12 1/2 x 19", U.S. merchant ship Joseph Thomas in hurricane; Sold. 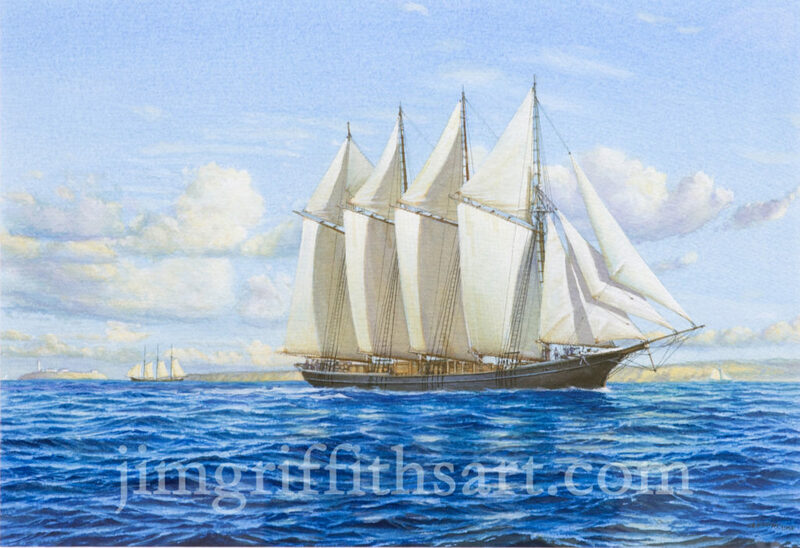 "In Her Prime", 10 1/2 x 15", U.S. extreme clipper Flying Fish; Courtesy of the Maritime Gallery at Mystic Seaport. 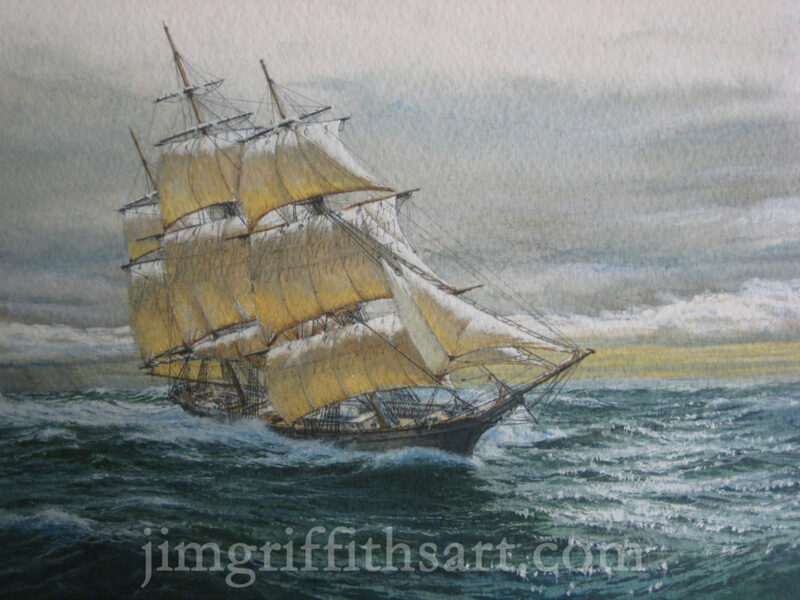 "In the Kingdom of the Wind", 10 1/2 x 15", U.S. medium clipper Bonita; Sold. 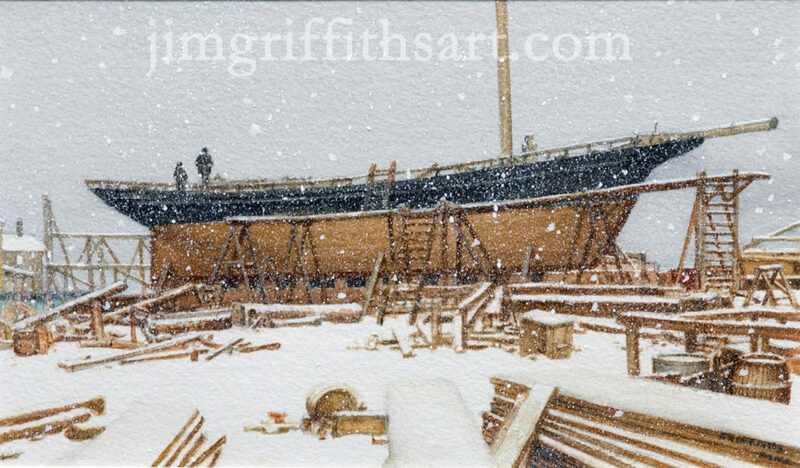 "In the Stillness of the Snow", 6 1/2 x 11", a New England shipyard in winter; Collection of the artist. 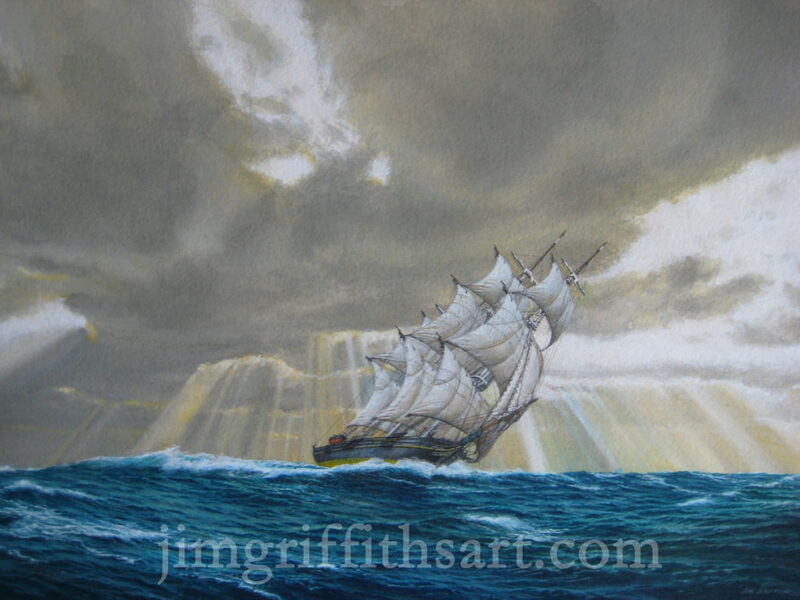 "Into the Light", 6 1/2 x 11", U.S. downeaster Indiana; Sold. 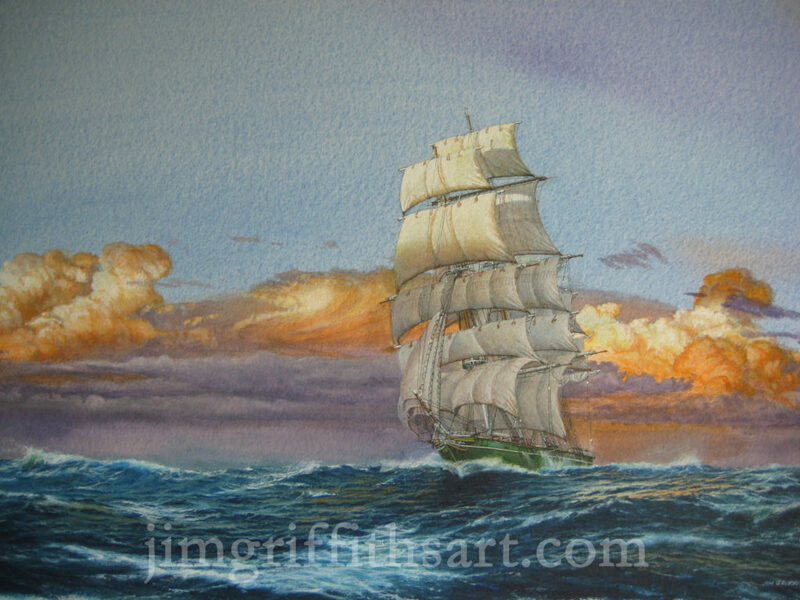 "Into the Sunlight", 6 1/2 x 11", U.S. medium clipper Herald of the Morning; Sold. 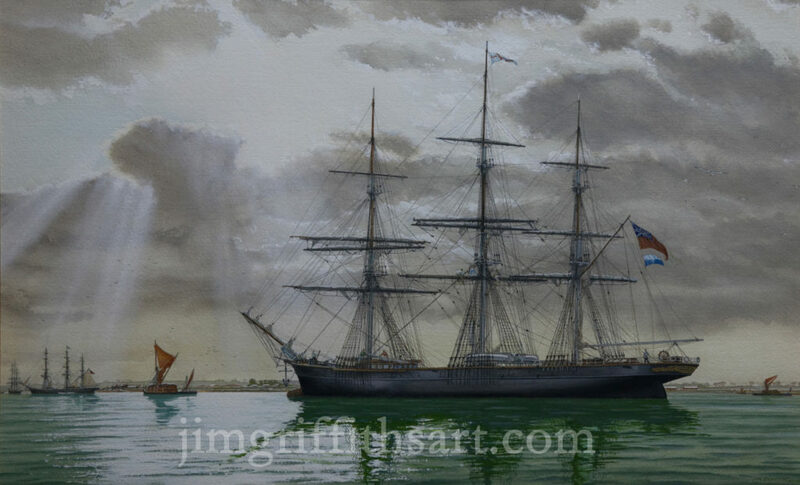 "Lahloo at Gravesend", 16 1/2 x 29 5/8",British composite-built tea clipper Lahloo at anchor; Collection of the artist. 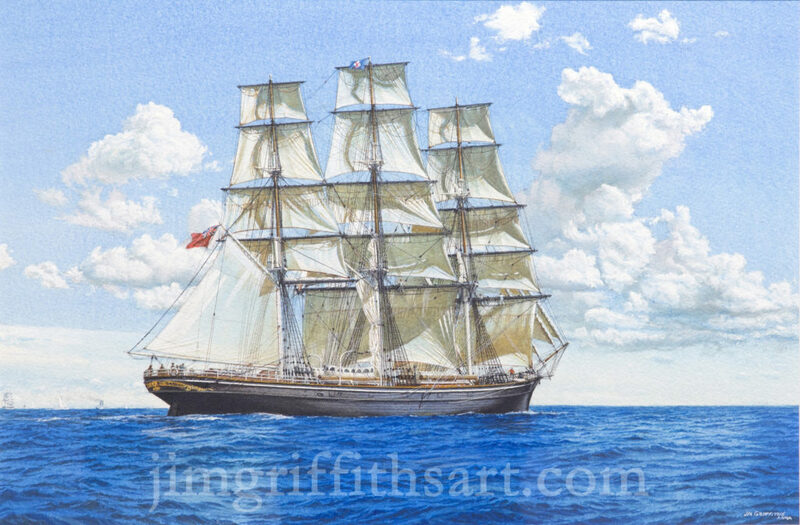 "Lahloo in Light Airs", 10 1/2 x 15" British composite-built tea clipper Lahloo; Courtesy of the Jinishian Gallery. 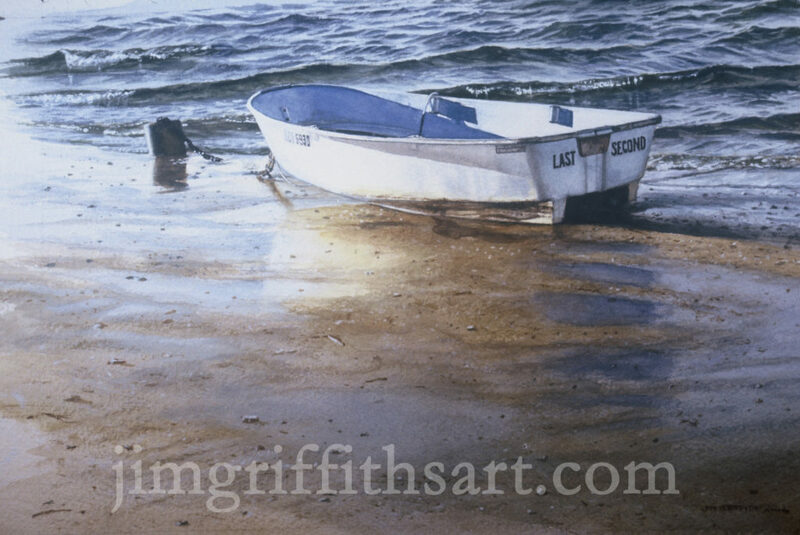 "Next to the Last Second",10 1/2 x 15",dingy beachside on Nantucket Island; Sold. 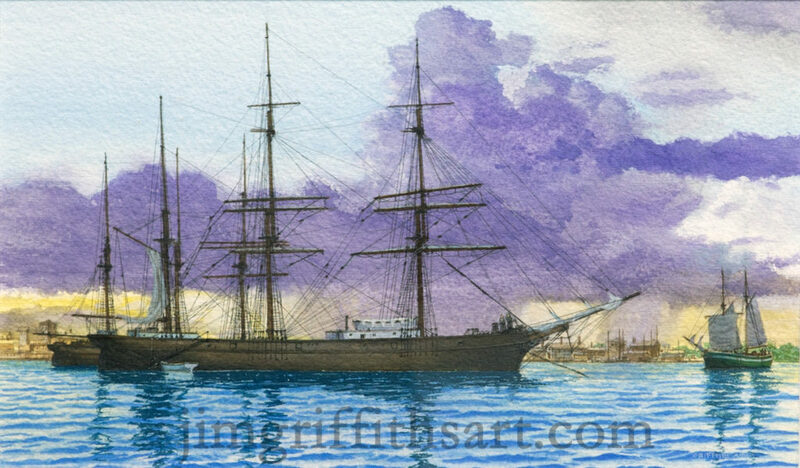 "None Better", 12 x 19", USS Constitution in 1815; Sold. 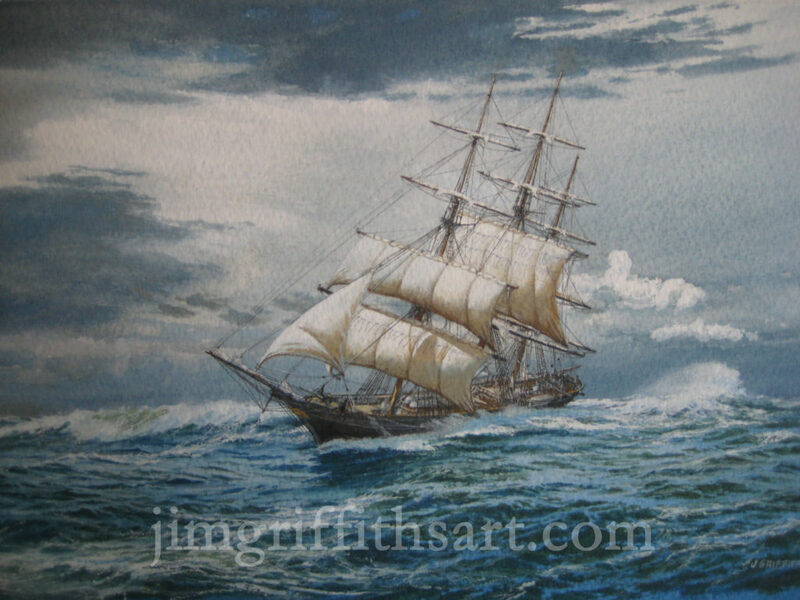 "On a Wind That Follows Fast", 6 1/2 x 11", U.S. clipper Witch of the Wave; Courtesy of the Maritime Gallery at Mystic Seaport. 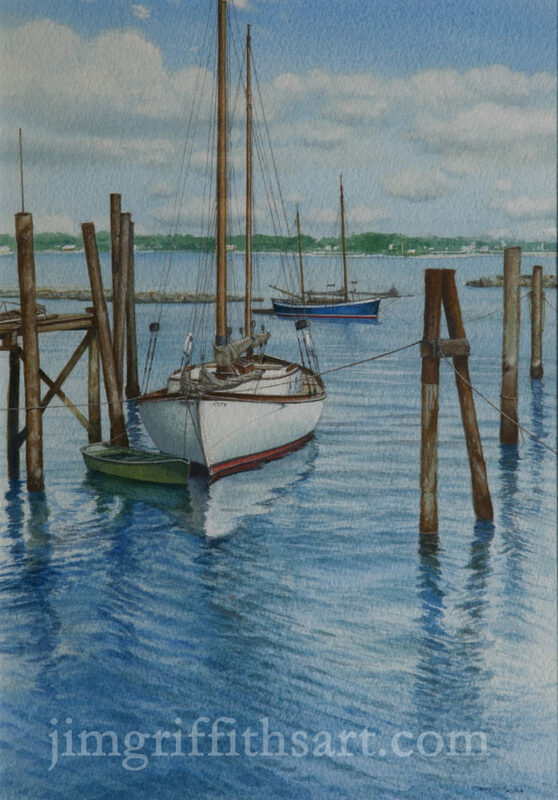 "Between Rain Showers", 10 1/2 x 15,” Gloucester mackerel seiner circa 1901, Courtesy of the Maritime Gallery at Mystic Seaport. 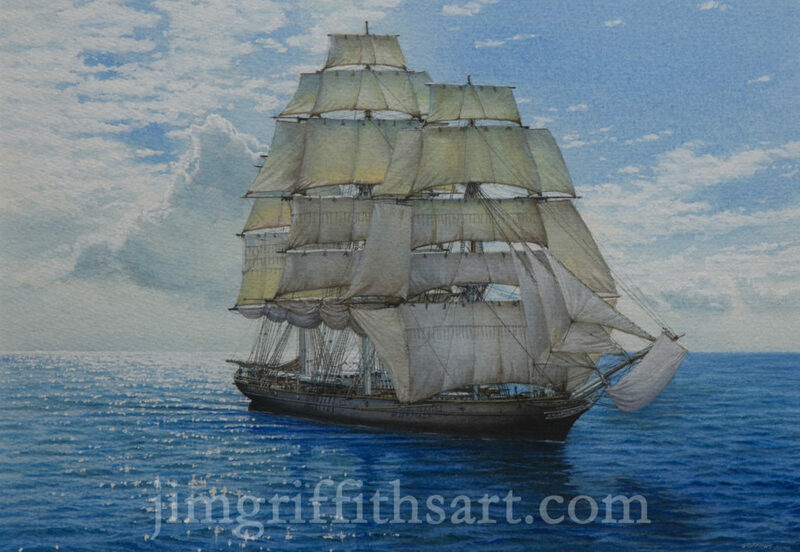 "A Glimpse of Sun", 12 1/2 x 19,” American extreme clipper ship Flying Fish, SOLD. 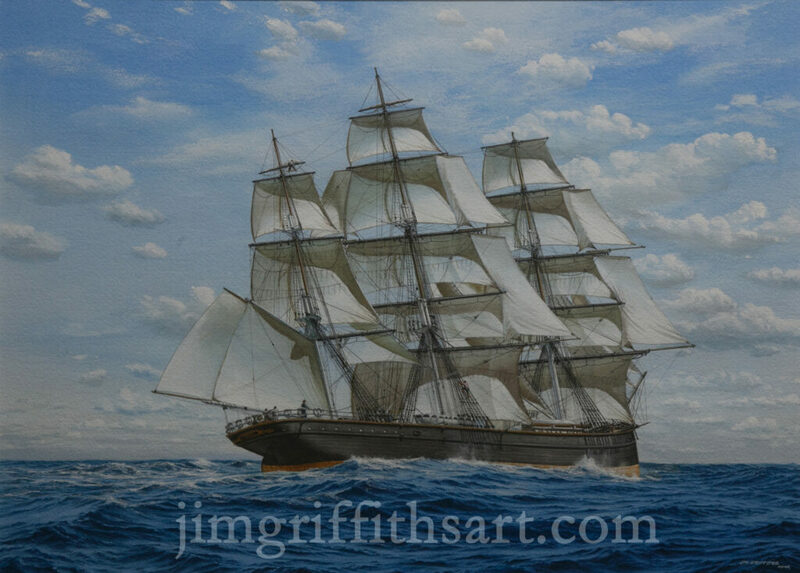 "Cutty in the Wool Trade", 12 1/2 x 19,” Clipper ship Cutty Sark departing Sydney, Australia, 1888, Collection of the artist. 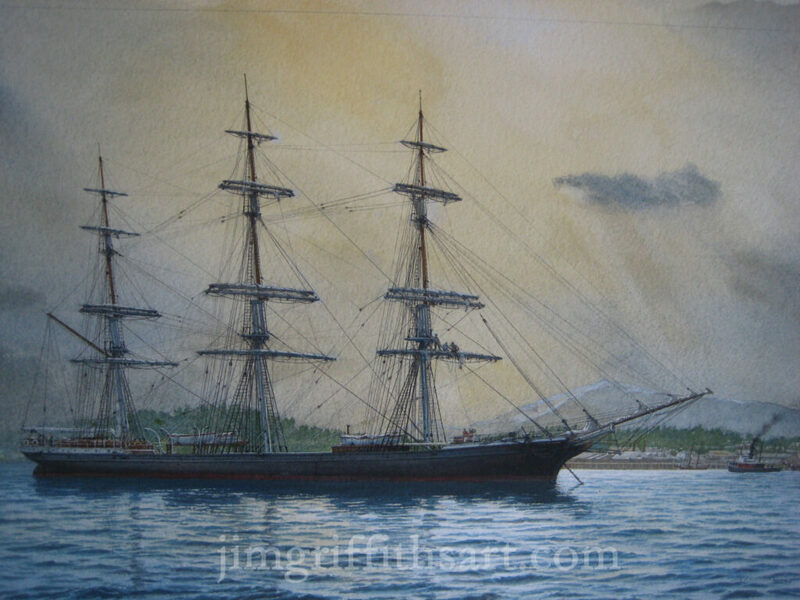 "Never Has She Failed Us," 12 1/2 x 19 ', Constitution vs Java, December, 1812; Sold. 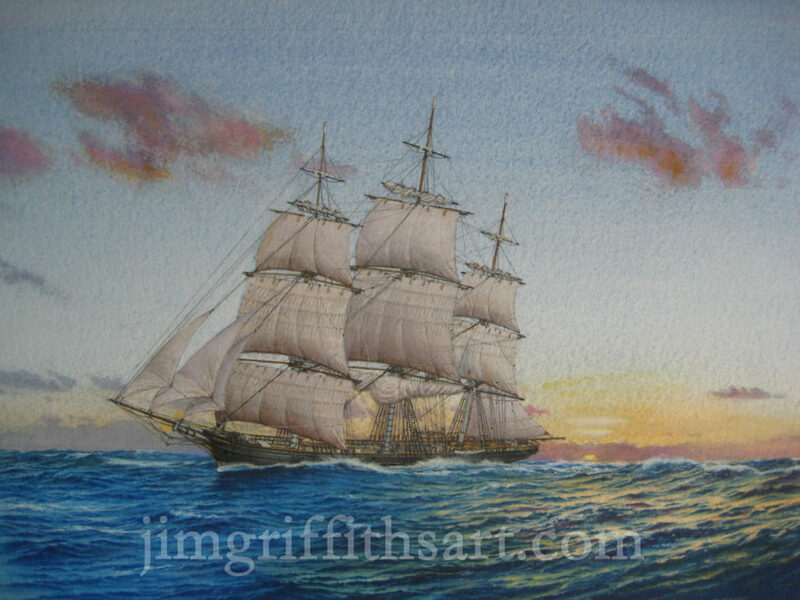 "On Her Way", 12 1/2 x 19", U.S. clipper Witch of the Wave; Sold. 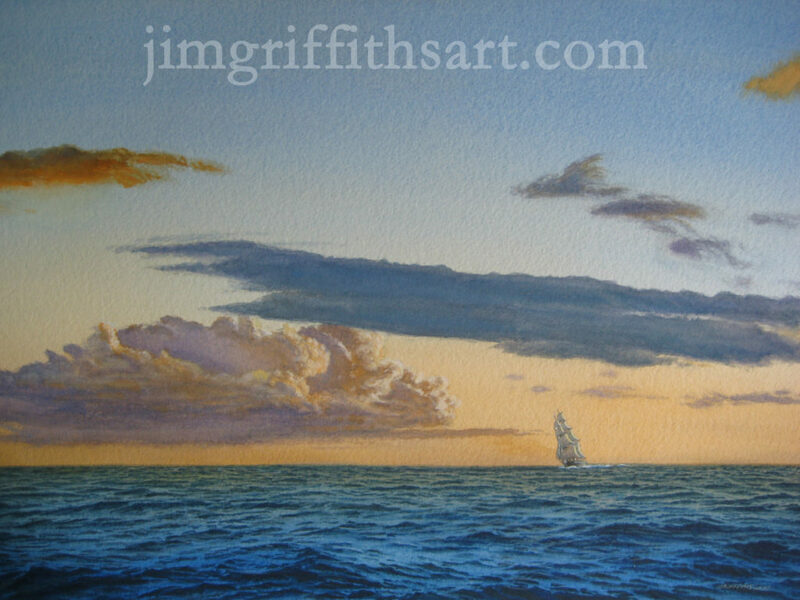 "On Towards Evening", 6 1/2 x 11",Mackerel Seiners at rest; Sold. 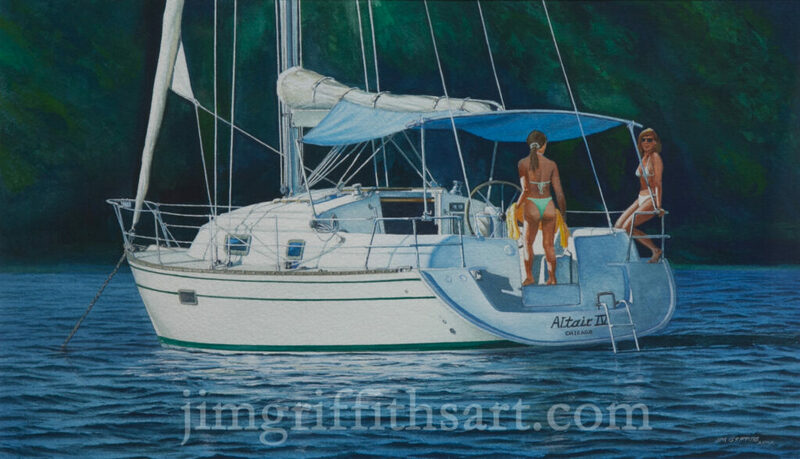 "On Vacation off Antiqua - Summer on the Sound", 11 3/4 x 20", Vacationing on the Caribbean; Collection of the artist. 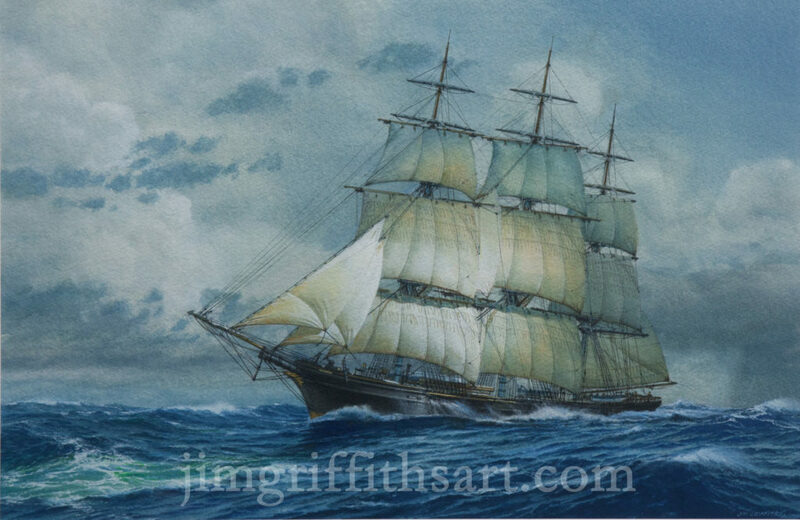 "Pacific Sunrise", 6 1/2 x 11",U.S. extreme clipper Sweepstates; Collection of the artist. 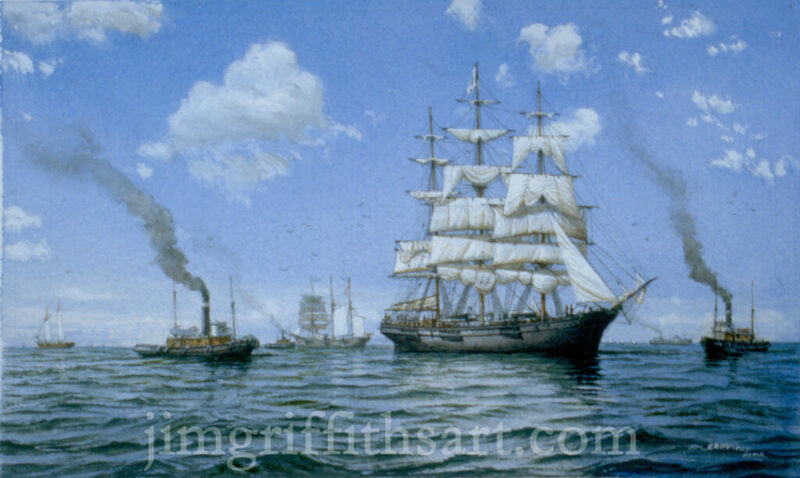 "Pilot on the way", 12 1/2 x 19", New York hrbor pilot schooer, 1855; Sold. 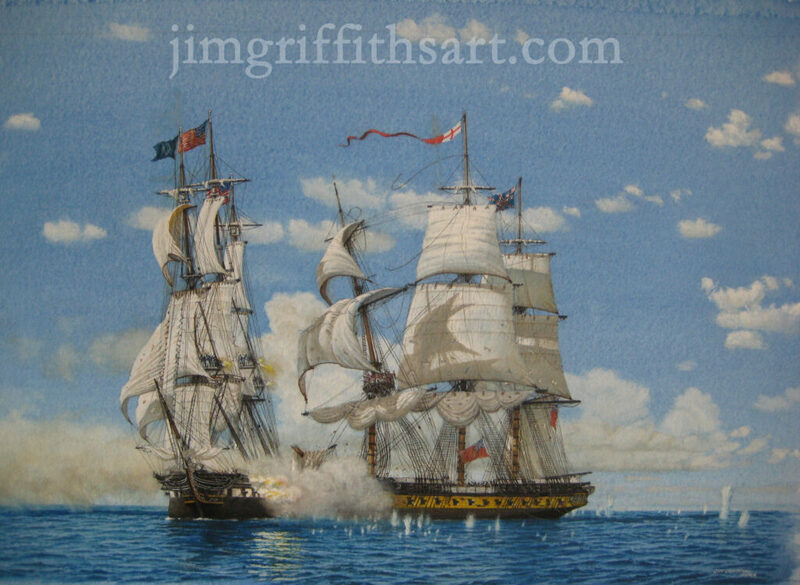 "Power & Grace", 12 1/2 x 19", British teaclipper Thermopylae; Sold. 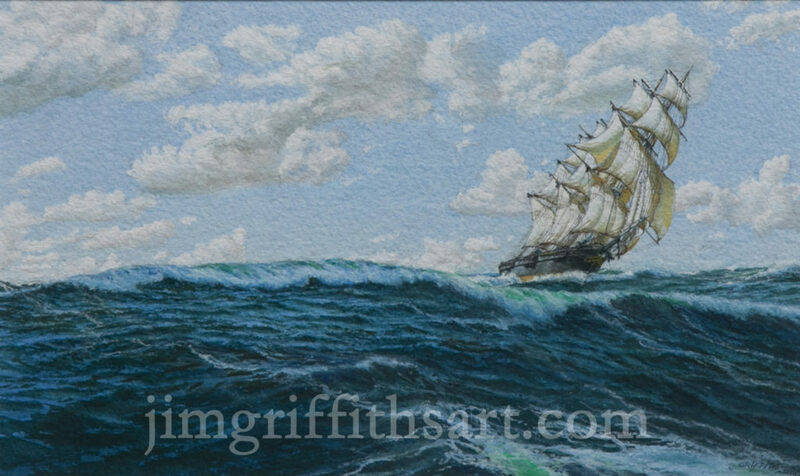 "Pushing It", 12 1/2 x 19", U.S. extreme clipper Flying Fish; Sold. 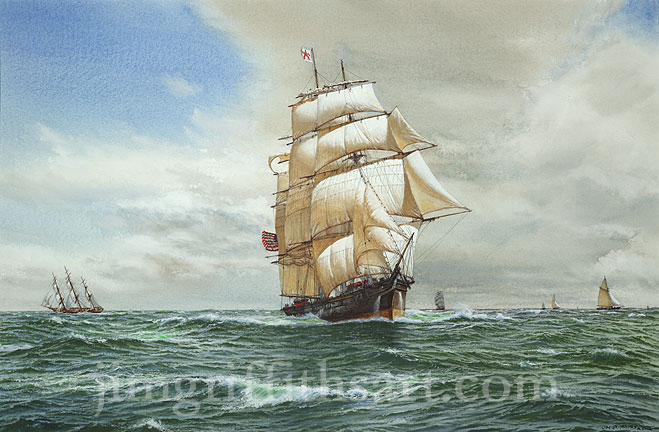 "See How She Walks the Water", 18 1/2 x 25 5/8", British teaclipper Kaison; collection of the artist. 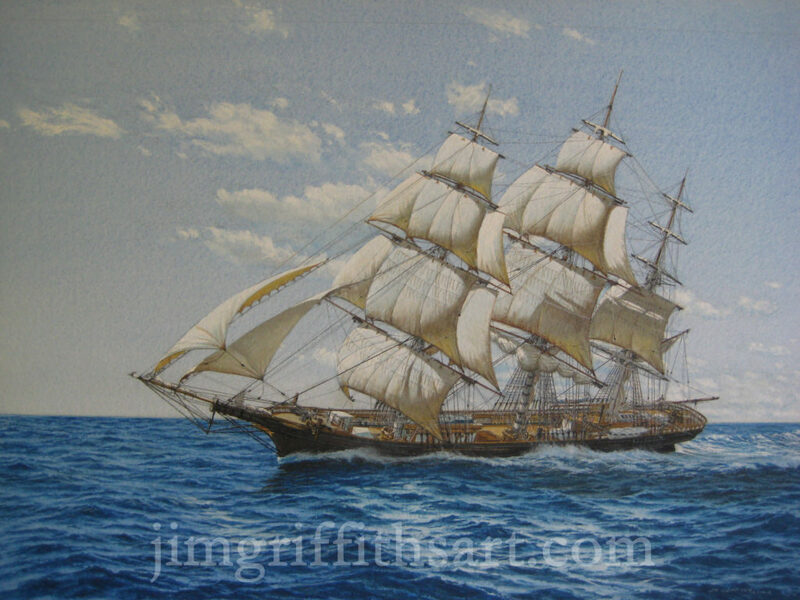 "Sovereign of the Seas", 6 1/2 x 11", U.S. 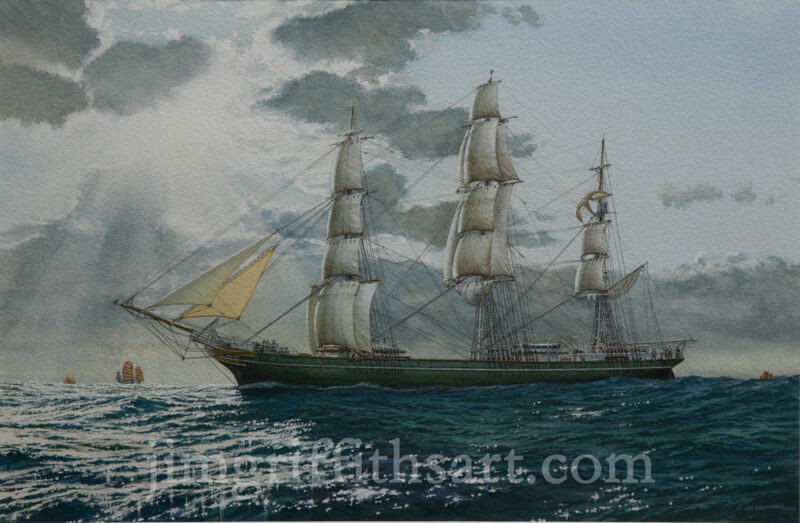 Extreme clipper Sovereign of the Seas; Sold. 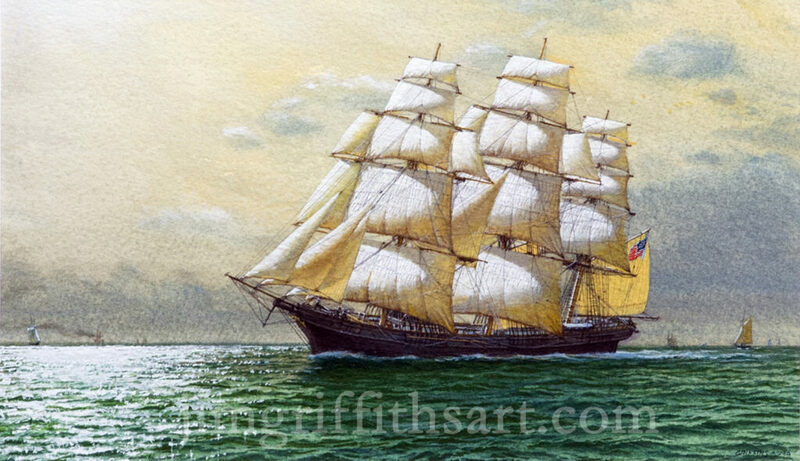 "Star of Bengal", 12 1/2 x 19", Iron-hulled ship Star of Bengal; Collection of the artist. 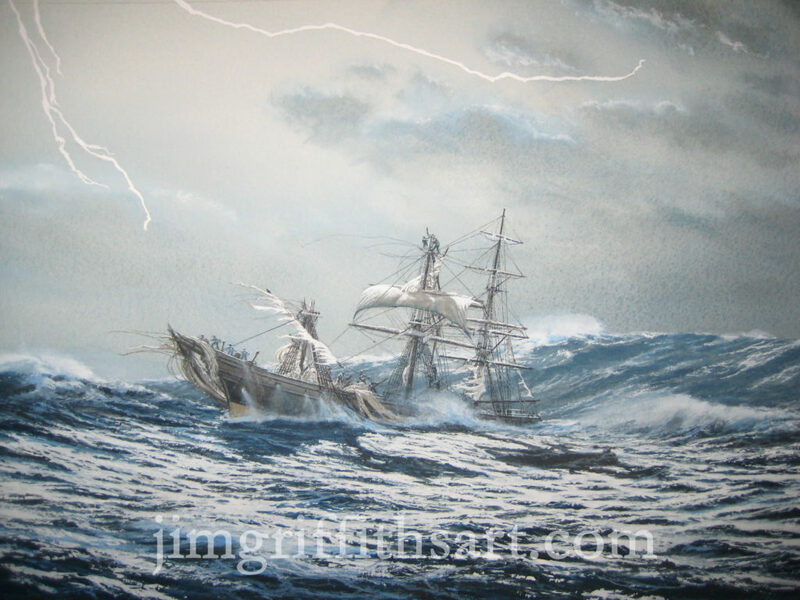 "Storms Astern", 6 1/2 x 11", British tea clipper Ariel; Sold. 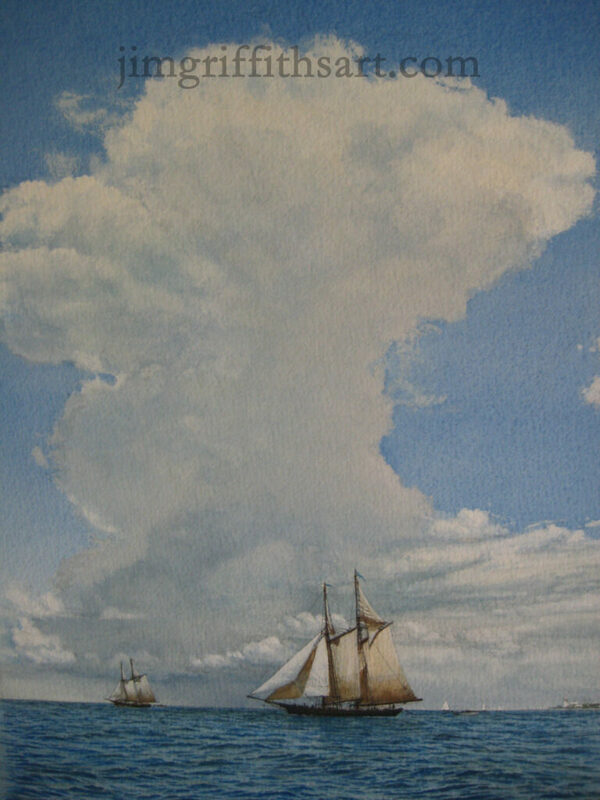 "Summer Skies", 11 1/4 x 16 1/4"(vertical), A thunderhead towers over Mackerel Seiners; Courtesy of the Maritime Gallery at Mystic Seaport. 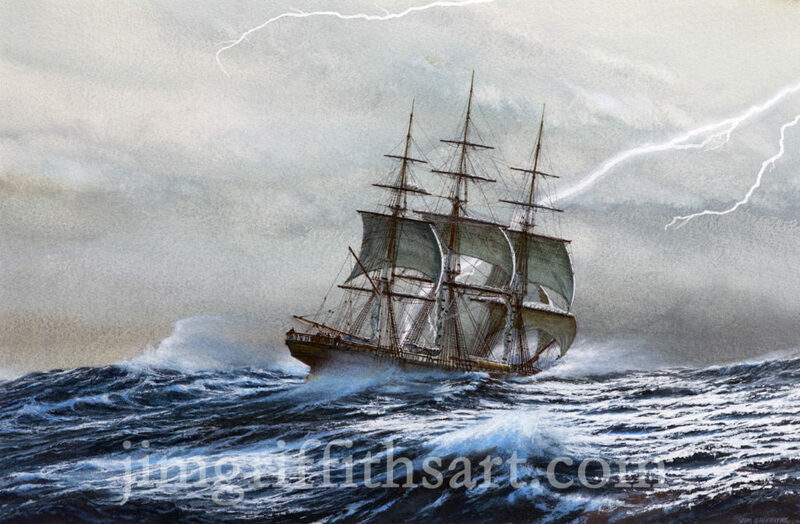 "The Clippership Comet in Severe Weather", 12 1/2 x 19", U.S. clipper Comet in hurricane; Sold. 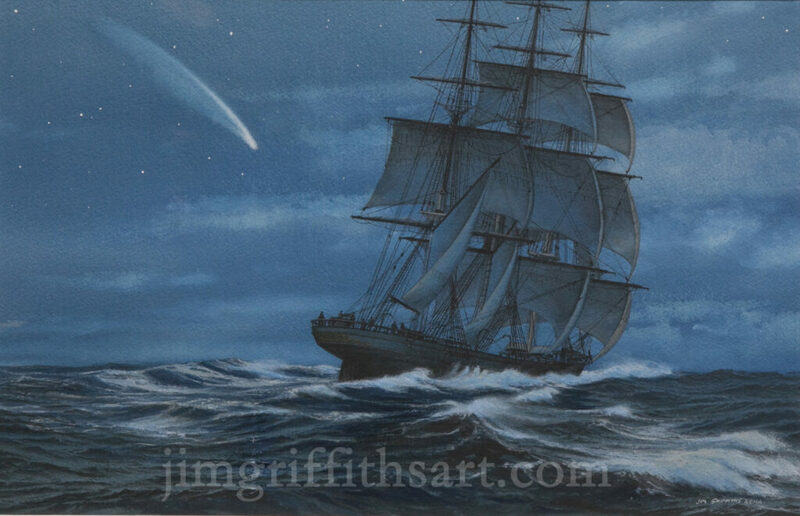 "The Great Comet of 1858", 12 1/2 x 19", U.S. clipper Young America; Collection of the Artist. 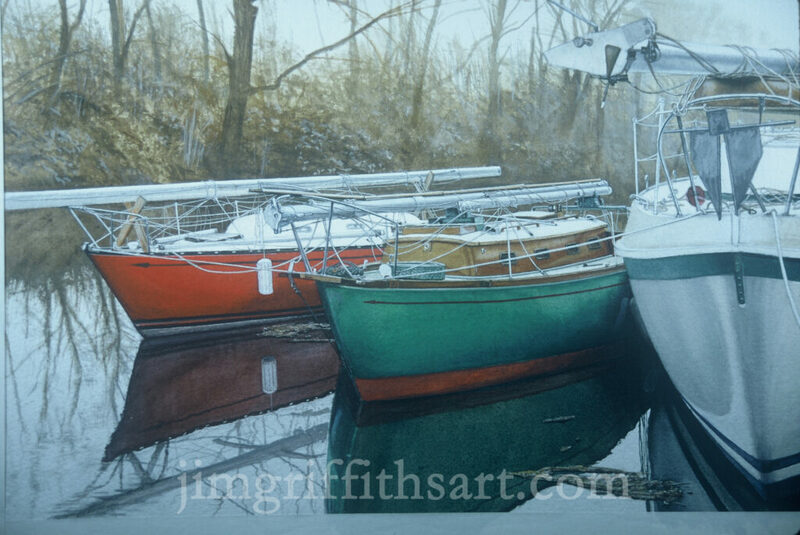 "Waiting Patiently", 10 1/2 x 15", Sailboats in Winter storage; Sold. 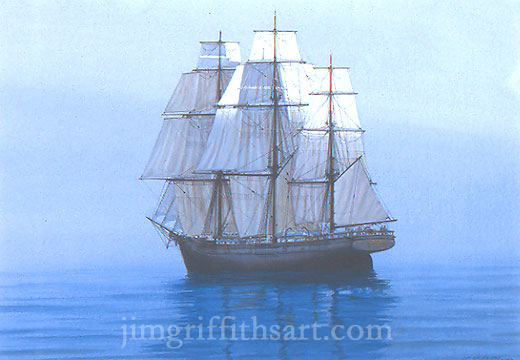 First Light, 10 1/2 x 15"; US clipper Syren, becalmed; Sold. 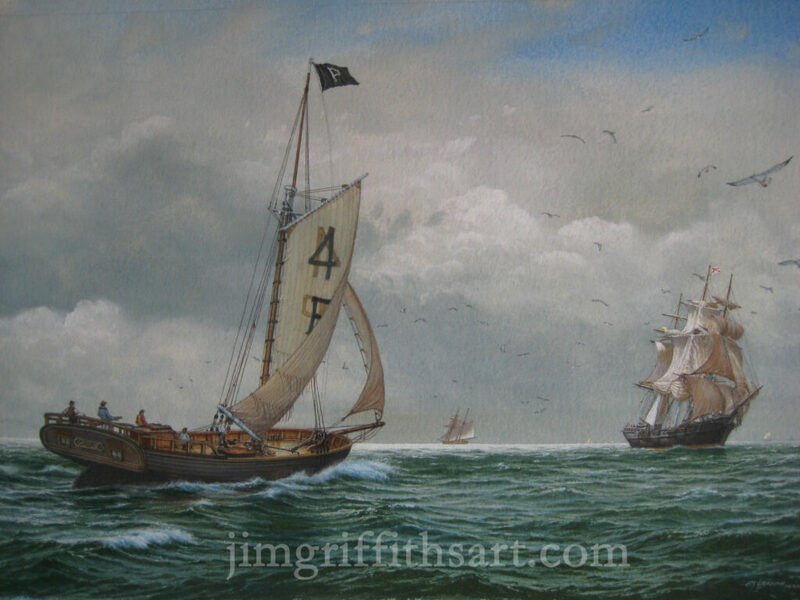 Busy Morning, 6 1/2 x 11"; US Downeaster Florence bargaining for a tow; Sold. 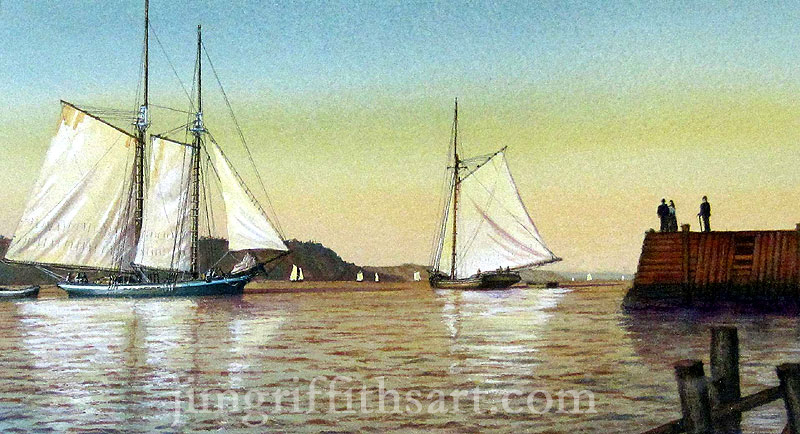 Heading Down the Hudson, 6 1/2 x 11"; Schooners head down the Hudson for New York City mid-1800s; Sold.